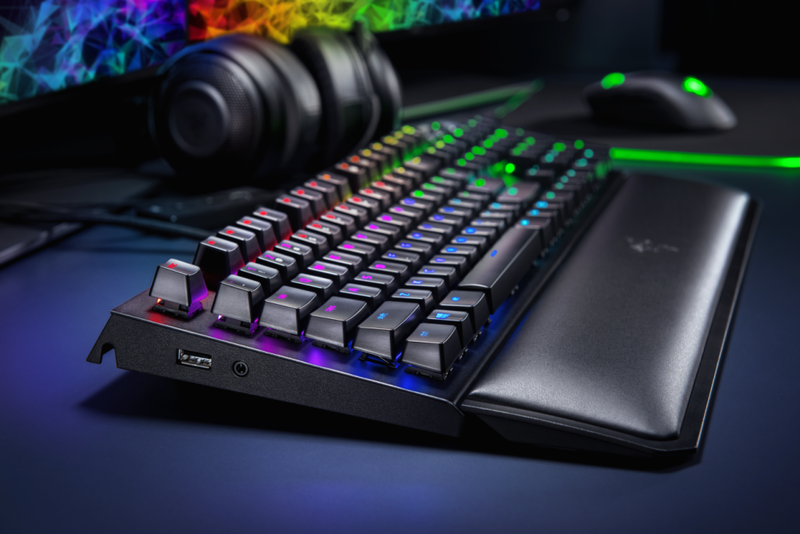 Today we’re going to be taking a look at the new Razer BlackWidow elite but with that let’s go ahead and just check this thing out it’s hard to miss that the black widow elite looks almost identical to the Huntsman elite that was released earlier this year. the keyboards memory and into the cloud to ensure you can always have your profiles wherever you go I still believe that synapse is the most user-friendly complete experience offered in a peripheral software and razer continues to roll out new features including the recently announced addition of third-party manufacturers to be integrated with synapse control as always the lights are nice and vibrant even without the white backplate now my only gripe is that the secondary functions still aren’t illuminated not a huge deal but it is kind of annoying when using the keyboard in the dark if you’re familiar with the huntsmen elite you might notice that there’s no under glow light bar around this board or the wrist rest it looks like that feature will be reserved only for the new flagship although the lack of this feature does allow the Black Widow elite to retain some extras that the Huntsman doesn’t have namely the USB and Audio pass-through now it’s a little bit weird because it’s located on the left side of the board you have a single dual 3.5 millimeter audio jack and of course the USB pass-through which does require the use of a second USB connector in the PC but I’m always happy to see this addition as it is pretty handy as for some other features the Black Widow elite has a cable routing management system integrated under the board to help keep those cables a little bit cleaner on your desk and it does have the addition of dedicated media keys so finally a black widow with media keys these RGB enabled keys work just like the dedicated media keys on the huntsmen elite and include the digital dial which can be used for volume control by default or remapped for editing functions and software’s for example or any variety of uses my heart does hurt a little bit for the lack of dedicated macro keys call me old-fashioned but I just like having dedicated buttons razors new hyper shift technology does allow rapid use of a full set of macro keys on the entire board but it’s just not the same as tangible buttons for me still it seems Razer is going all-in on the hyper shift tech as the last few releases have been without dedicated macro keys one of the critical differences between the Black Widow elite and the Huntsman is the switch options while the Huntsman will only offer their optical switches the Black Widow will continue to offer their three conventional mechanical switches except now these switches have been upgraded the new razor switches address the one problem that I have had with their switches over the years and that they used to have a pretty profound key wobble the new design adds side walls around the switch stems to keep the switch stable during the entire keystroke which eliminates the key wobble the razor switches will retain the same specs as before but they do have an added feeling of quality now and I’m personally really excited to see Razer continuing to make an effort to improve on their switches which really they could have just easily kept them the way they were and just kept on going of course I wouldn’t leave you guys without a sound test so here’s a sound test of the new Razer green switch the key caps on the Black Widow elite are the same ones you’ll find on any of razor’s mechanical keyboards over the last two years they have a nice clean minimalistic font which I think looks pretty good and the key caps are made out of ABS plastic and do have a nice smooth texture to them the underside of the board has a cable routing management system that I mentioned earlier and does have two-step extendable legs to help position the board at a better angle for you and it does have plenty of rubberized pads on the bottom of the board and wrist rest to keep it from sliding around on your desk overall the Black Widow elite is certainly a change from the classic black widow design the removal of the dedicated macro keys and the nice reflective white backplate is a bummer for me but the inclusion of the dedicated media keys is a huge plus and much like the Black Widow ex that came before it that added some variation to the line it has a clean design and some great features if you’re trying to decide between the huntsmen elite and the Black Widow the main differences are the switch types and the ambient lighting around the board for it comes in just below the point of the huntsmen elite and this right in line with other flagship keyboards the Black Widow elite is a solid keyboard and shows yet again that razor continues to make concerted effort to listen to our feedback and improve on their products. Ali is an IT graduate passionate about technology especially storage drives. He loves to write about technology and computer parts.